Our modern society relies on high standards in construction to ensure optimal safety in a variety of hazardous situations. Fire risks are one major concern that architects, designers, and builders need to work to minimize in order to give occupants ample time to escape a structure in the event of a fire. Today, our drywall company will continue to look into fire resistant drywall and its different uses. When deciding on which gypsum board you want to use for your building renovations, it’s important to choose the one that maximizes your safety while also making fiscal sense. For example, it wouldn’t be economical to outfit your closet with with top-rated drywall. Any gypsum board that is designated as fire resistant must pass a third-party inspection and test by a recognized party to ensure quality conformity. For general purposes, there are two fire resistant wallboards that can be helpful in optimizing your structure’s safety while appeasing the mandatory fire code requirements in the process. When you imagine drywall that is made to further resist fire, you’re likely picturing Type X wallboard. This product is made with extra glass fragments that are spread throughout the core of the board. Glass is a non-combustible material that will resist the heat of a fire while helping to strengthen the structural integrity of the entire sheet. 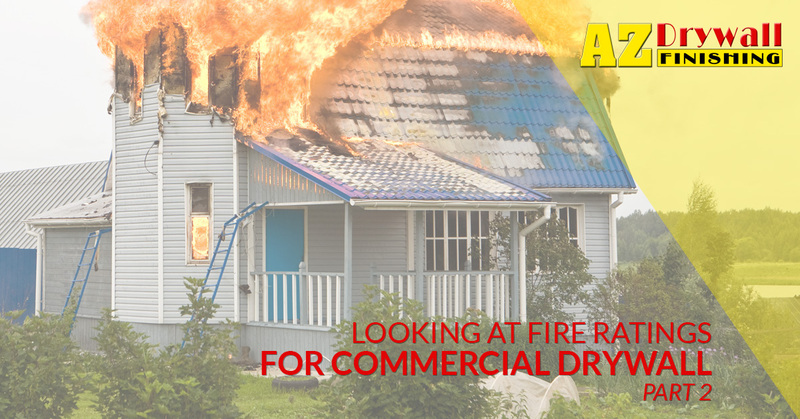 Fire causes water to evaporate, drying out the boards and causing them to fail structurally. Type X drywall is a standard option for rooms that are inherently more risky for fires, including kitchens and bathrooms. This style comes in a standard ⅝” thick option and is rated to resist a fire for 60 minutes assuming that standard framing is installed correctly. This style of wallboard is often referenced as a more-advanced version of Type X drywall. Type C utilizes more glass fibers for better fire resistance to match specific requirements for different building applications. When drywall installation is completed properly, Type C can resist fires for up to 4 hours! While more costly, this style can prove to be life-saving in several settings. One key part of the drywall installation process is the accuracy in which it is done. The entire purpose of fire resistant drywall is to protect inhabitants from smoke and flames long enough to escape the building through an approved fire exit. When installed incorrectly, drywall has the potential to fail more quickly than other materials in the event of a fire. In some cases, it may provide zero smoke and fire protection! It’s essential to find an experienced commercial drywall company that has the skills and tools necessary to get the job done right the first time. AZ Drywall Finishing is proud to be your go-to drywall company in Chicago. Our staff focuses on quality and accuracy on every single job to ensure that our customers are receiving the absolute best results. Contact us today to see what we can do for your building!